I would like to know how to display the closest NAVAIDS that the aircraft is crossing either by reading a SQlite database or by comparing a flight plan loaded in the tracker. Always comparing the position of the aircraft to the beacon. Second point you gave me code to find the runway in service against the wind. But in the latest version of your dll you have also implemented AI traffic from IVAO. How to find either according to the Metar or according to the AI traffic. I would like to know how to display the closest NAVAIDS that the aircraft is crossing either by reading a SQlite database or by comparing a flight plan loaded in the tracker. Always comparing the position of the aircraft to the beacon. The distance between the aircraft and the navaid can be calculated using two FsLatLonPoint classes. One for the aircraft and one for the NAVAID. The location of the navaid is more of a problem. If you have a flight plan with the locations of the navaids then just check against all of them to see which is the closest. Or, you can just test them in the order they come in the flight plan. Start with the first navaid, then when the player has crossed that one, move on to the next one. You might consider that the aircraft has 'crossed' a navaid when it comes within a set distance (e.g. 1km). If you just have a database of navaids and no set route to follow then it's more difficult. It's probably not practical to measure the distance to every navaid in the database. So first you'll need to filter those navaids which are in a set range of latitude and longitude. For example you might first select navaids from the database which are 0.5 degree of latitude and longitude either side of the aircraft. This way you have fewer navaids to calculate the distance for. Second point you gave me code to find the runway in service against the wind. But in the latest version of your dll you have also implemented AI traffic from IVAO. How to find either according to the Metar or according to the AI traffic. You can find the active runways used by the AI Traffic by passing the ICAO code of the airport to GetArrivalRunwaysInUse() or GetDepartureRunwaysInUse(). This only works for airports in range of the player because it needs active AI traffic at that airport, or inbound to the airport. For departure runways, ground AI is required. The player must be at the airport. For arrival runways, airborne AI is required. The player must be within 40nm of the airport. HOWEVER: As far as I know, IVAO traffic does not have assigned runways filled in. So the result is only for the normal AI Traffic. If IVAO traffic is using a different runway than the AI Traffic then there is no way to tell this. Can you help me please in Vb.NET? 2) Maybe catch frequencies tuned by ADF NAV (I have not idea how to work GPS or FMS in virtual life) and compare with the DB ? 3) For Arrival runways maybe find the closest in range of 40NM around airplane. I can't really help with that specifically. I don't know those databases and I don't know SQLite. I can only give you a general method of how it's done. I can't write the code for this, sorry. Yes, that's a good way of doing it. FSUIPC has offsets that give you the Lat/Lon of the ADF and VOR beacons tuned to the radios. Here is a VB example of using the new Airports Database to do this. You must have the makerunways.exe files in the main Flight Sim folder. Then you can use this code to get the airports within 40nm and find the active runways according to the AI Traffic. The results are displayed in a listbox called lstActiveRunways. Not at the moment. I'm writing the examples for the proper release of 3.0. It's all in C# as the project is very large. Writing it twice would be too much work. I'm hoping to automatically translate it to VB when it's finished. It will take a long time to do it manually. I've attached the latest DLL. Thanks but without db is Lat/Lon can't help me. Maybe use name and distance. And put all to the form. Ok need a timer to loop but at what frequency I do that ? please. I'm not sure what you are trying to do. It looks like you want to show the distances to way points (beacons) in a flight plan. Does your software have a flight plan? Or do your users load a flight plan in Flight Sim? No need for a timer. You only need to call this once, just after the connection is open. It takes about 2-3 seconds. You don't need to call this again. Yes my software have a flight plan. I'm talking about the function you give me. Okay. What information does it have for each navaid? Does it have the Lon/Lat for the navaid? Or just frequency and name? It doesn't need to be quick. I would think every 10 seconds would be fine. What information does it have for each navaid? Does it have the Lon/Lat for the navaid? Or just frequency and name? Yes, but what information is already in the flight plan? I don't think I understand what you want to do. Can you confirm the following is correct? Your software has a flight plan loaded. While flying, you want to show the user the next navaid and the distance to it. If that's wrong please explain what you need. What information does the flight plan contain for the navaids? The Tracker pass the route into php and plot the result to a map. You need to just keep track of which navaid is next. Then monitor the distance and show the user. When the distance is under a certain number (maybe 0.5nm) then move to the next navaid. I can't write the exact code because I don't know about your flight plans.
' You need to get the ID and Lon/Lat of the navaid from your flight plan.
' You should use the nextNavAidIndex to tell you which navaid to get. Dim navaidLat As Double = "45.123456"
Dim navaidLon As Double = "-2.123456"
You need to call displayNextNavaid whenever you want this information to be updated. Every 1 second (1000ms) should be fine. 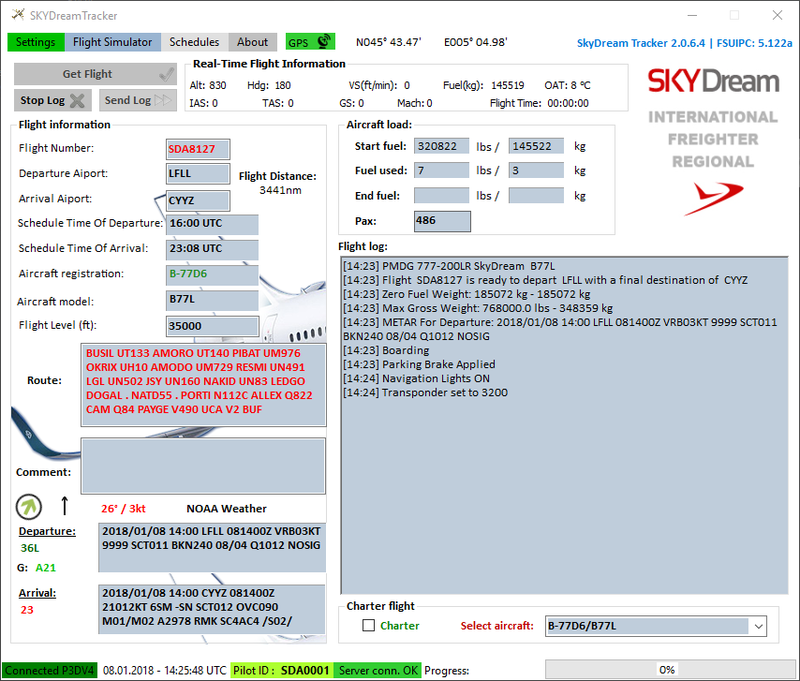 So the flight plan is not loaded in Simulator the NAVAIDS pilot put into the route are send to the website. You mean when the route field is not empty || NULL ? The flight plan does not need to be loaded into the simulator. Does your program have access to the lat/lat for the Navaids? Or are they are only on the server? If so, you'll need to rely on the radios being tuned and get the lat/lon from offsets 1124/1128 etc. See post #4 earlier in this thread. Otherwise just take them directly from the flight plan. Any time between the user entering the flight plan and starting the flight. If you send the flight plan to a server then that would be a good time to count the number of waypoints and set this variable. Does your program have access to the lat/lat for the Navaids? Or are they are only on the server? Only on the server. No way to have a better or simple method to do this even I need a pln ? if yes how to adapt your code ? Forget one thing sorry for that need to catch also the status of the runways in realtime. If you make your users load a flight plan (pln) in FS it will be much easier. There is lots of data available from the 'GPS' offsets starting at 0x6000. See the offsets list. e.g. there is distance to next way point (0x60EC). In this case there is no need to track the offsets yourself, it's all done by the Flight Sim. So just access the required offsets directly and display the result. What do you mean by the 'status' of a runway? example is for Runway 09 at EGJJ. The surface wet/dry/icy/snow is available from offset 0x346, BUT it only updates when on the runway. Not in the air. Big problem most of my add-ons I have doesn't use GPS to follow a flight plan or a flightpath.ex: PMDG DASH-8 Majestic GTN . So have you an idea to know the nearest Navaid with an other method. Or have you a sample somewhere to share ? 1. Get back the Lon/Lat of the navaids in the flight plan from your server. 2. Get the Lon/Lat of the navaids from a database. 3. Get the Lon/Lat of the vor/adf beacon tuned on the radios. 4. Get the distance to the next navaid from the GPS offsets (but this requires a flight plan loaded). Thanks Paul maybe to hard for me. Dim flightypeSchedules As Boolean = Me.lblFlightNumber.Text Like "SDC? *"
Dim xml As String = DateTime.UtcNow.ToString("[HH:mm]") & Chr(32) & "Taking Off with " & lblPAX.Text & " lbs Cargo on board" & "*"
Dim xml1 As String = DateTime.UtcNow.ToString("[HH:mm]") & Chr(32) & "Taking Off from Runway " & runaway & Surface & "*"
Dim xml As String = DateTime.UtcNow.ToString("[HH:mm]") & Chr(32) & "Taking Off with " & lblPAX.Text & " passengers on board" & "*"